Has it been so long since we were having summer splashes and DIY car washes? Today marks the first day of Back-to-School for my son. You know what that means? Roll out everything pink, girly and sparkly. My 2 year old daughter and I are living up our special “girl time” to the nth degree now that school is in session. Today I’m sharing my daughter’s latest favorite activity, Tea Parties. 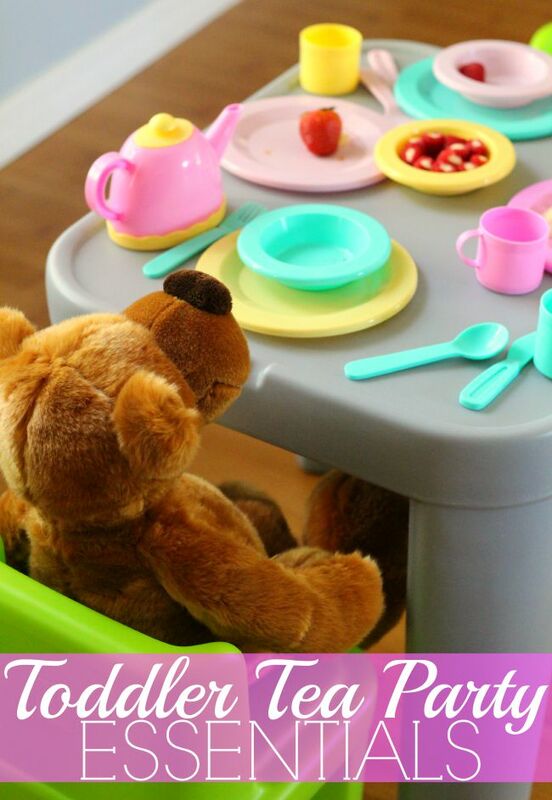 And with this ultimate Toddler Tea Party Ideas, you can enjoy a priceless tea party moment fit for a pretty princess. 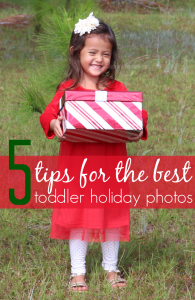 From snack ideas to picture moments, this is one of my fave posts to date! One of my favorite parts about being a mom to a little girl is watching her excitement about getting dressed up. She loves any dress that’s “boo-tiful,” pink and 100% twirl-able. So it’s no surprise that when I said that we were having a “special” tea party today that she would run for the closet. No tea party is complete without someone to share it with. 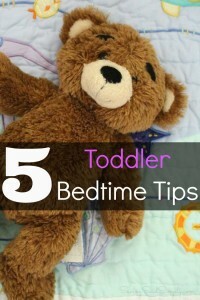 Be sure that your toddler grabs her favorite friend to join the celebration! 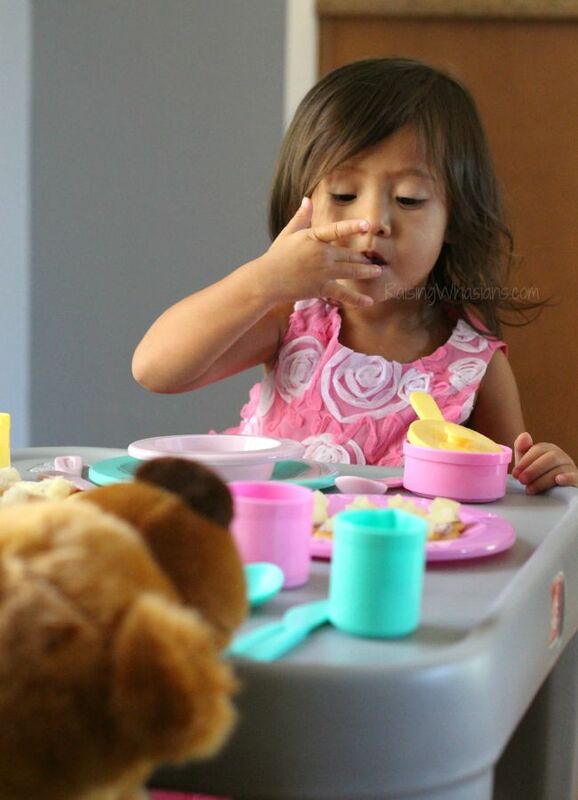 My toddler loved feeding her bear! The more dishes, the better! Don’t forget the all important tea pot and tea cups for your special event! 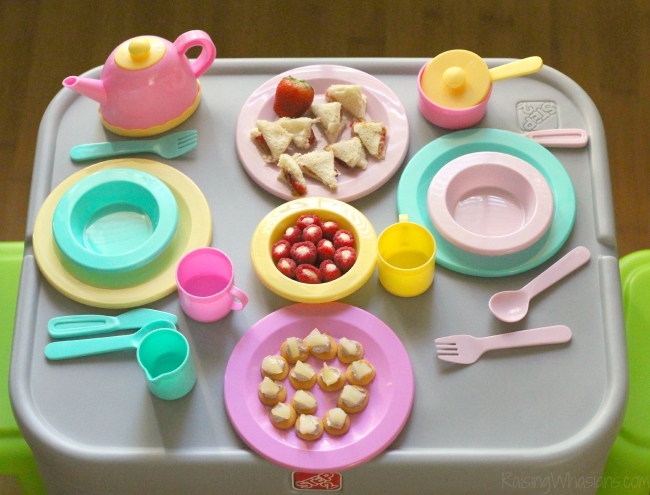 I love this little tea party set, with everything you need for adorable memories! What’s a tea party without the special munchies? 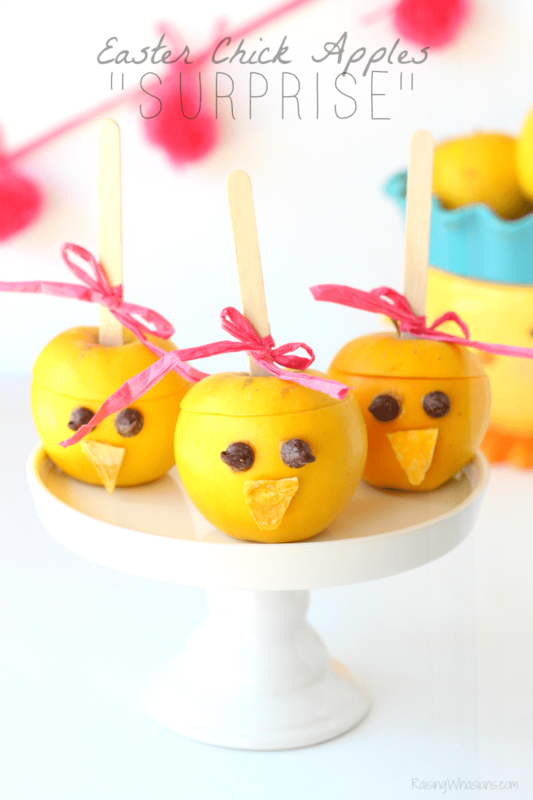 These Toddler Tea Party Snack Ideas are sure to be a hit for your next get together! 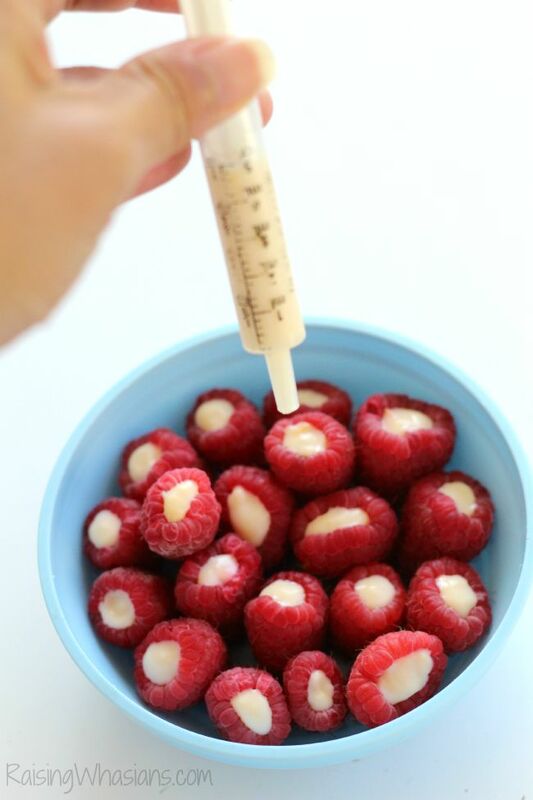 Use a medicine syringe to fill the insides of raspberries with yogurt. Freeze for 1-2 hours or until yogurt is firm. Enjoy for a delightful chilled snack! Forget the jam. Substitute fresh berries for your PB&J sandwiches for a beautiful and fancy touch. No crust, of course. The vanilla wafer has nothing on this snack! Top a mini wafer with blueberry cream cheese and a sliced pear. Drizzle with honey. This was my daughter’s favorite snack of the tea! An ultimate tea party of this magnitude requires more than just a table and chairs set. 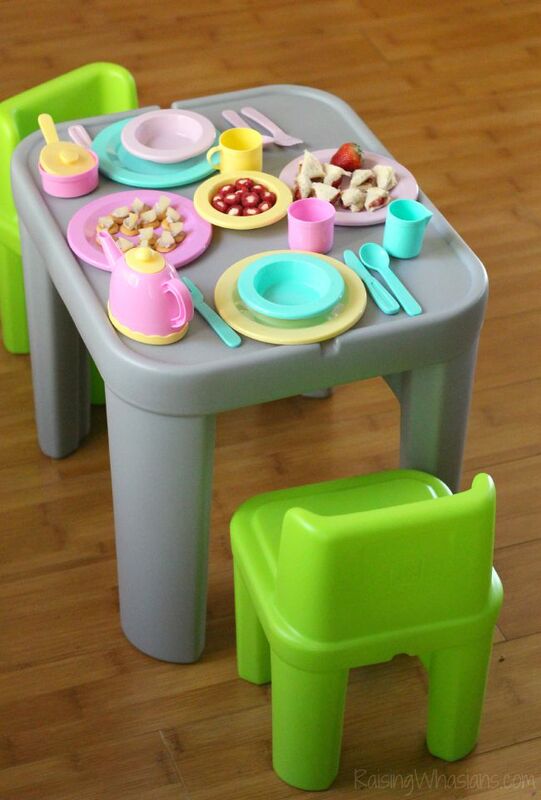 The brand new Step2 Mighty My Size Table and Chairs Set is the perfect place setting for our afternoon tea. 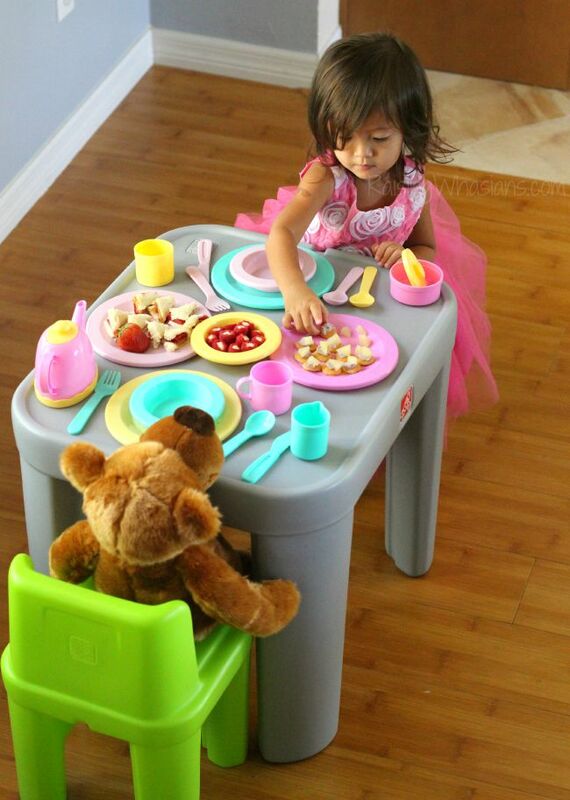 New for Fall 2015, this toddler table set “gets” exactly what I’m looking for playtime fun. Check out my favorite features! The first thing I noticed about the Step2 Mighty My Size Table and Chairs set is the surface area. There’s LOTS of it. This 23 inch by 19 inch tabletop is perfect for holding our plethora of tea party dishes. All 35 pieces of them at once. Much larger than other toddler table sets I’ve seen, I love how my girl has plenty of work space for all of her busy activities. For this frugal mom, when I’m looking for a table and chairs set for my children, I want one that’s going to last. 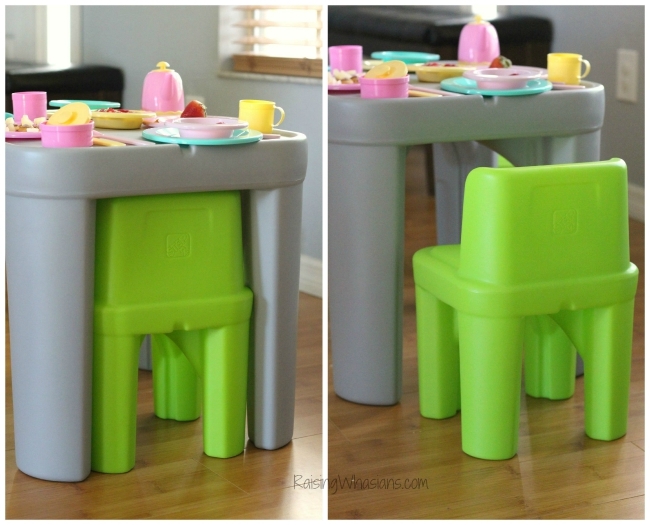 With the Step2 Mighty My Size Table and Chairs Set, there’s plenty of leg room for my 2 year old, with years of room to grow. There’s no scrunched knees to be found under this table! These adorably green chairs are the perfect size for my toddler. These chairs stand 16 1/4 inches high, with 10 inches from floor to seat. Made of sturdy non-foldable plastic and a weight limit of 50 lbs., I know these chairs will be able to hold up my kids for many years to come. Parents, I totally feel your pain. As much as we love toddler toys and furniture, the prime real estate of your house can become easily overrun with STUFF. I adore The Step2 Company’s space saving design with the new Mighty Me Table and Chairs. 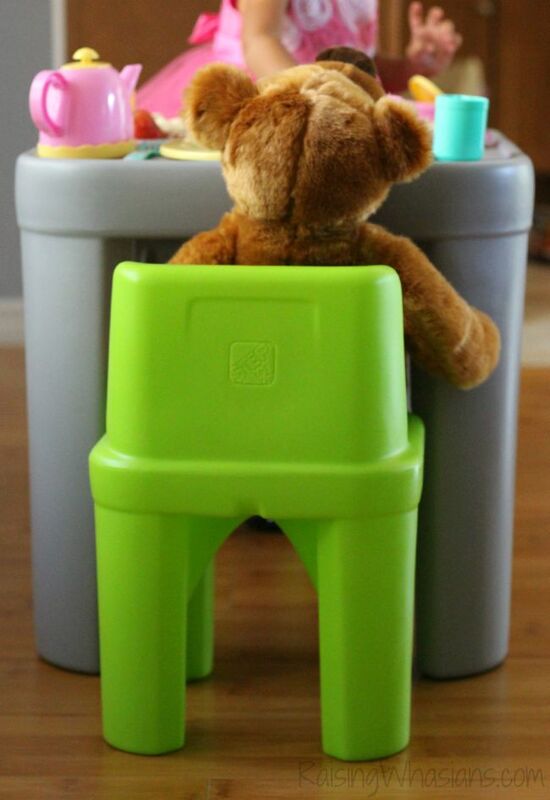 The chairs easily nestle underneath the table when play time is done, which makes moving and storing this set a breeze. You know how toddler table and chair sets go. They see lots of activity…a whole lifetime of toddler destruction worth. 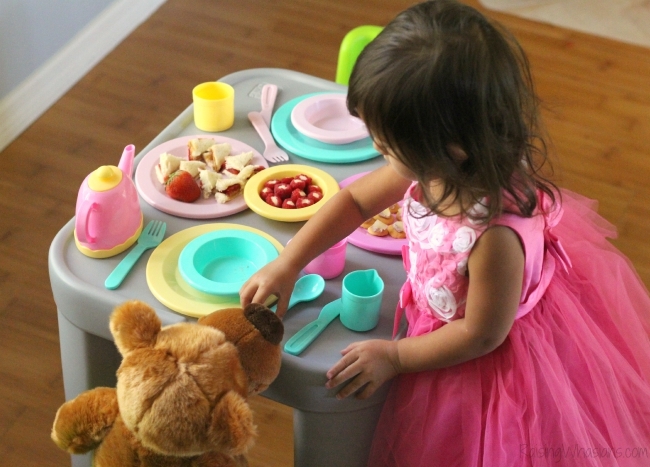 Step2 understands toddler play and ensures high quality and safe plastic materials are used for many years of play. 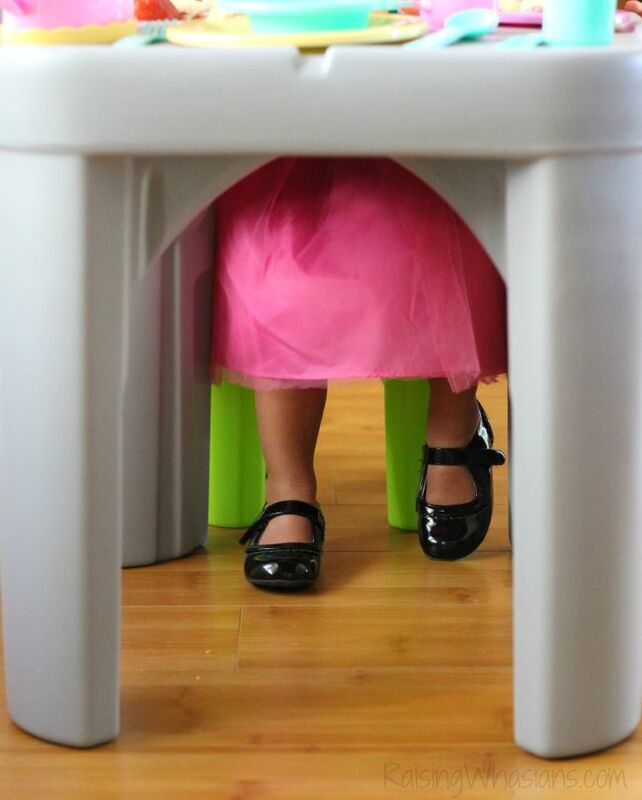 Easy to use, easy to clean and easy to store, it’s a dream table and chair set for this mom. And with NO assembly required for this set, we were up and running for crayons in seconds. I cannot wait for many more years of coloring, crafting, and of course, tea parties. Moms, get those cameras ready. With a picture-perfect playtime opportunity and a small window of toddlerhood bliss, you have to soak it all in. 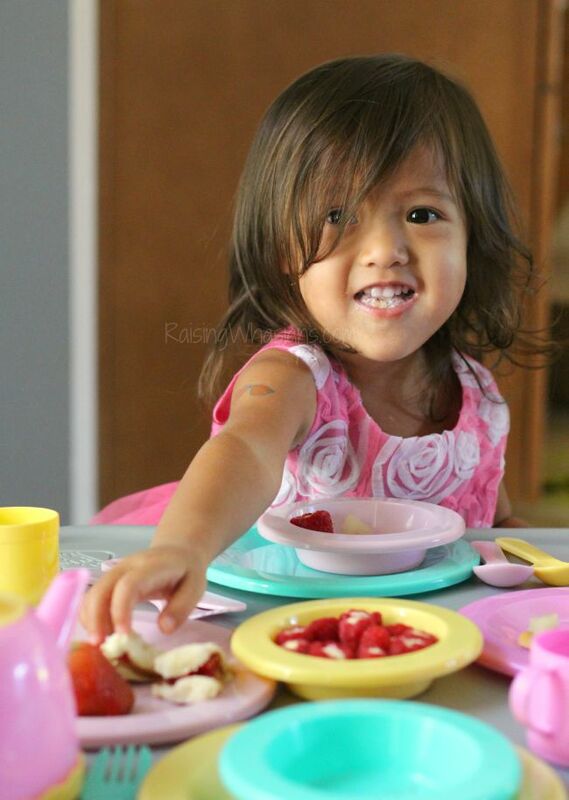 Be sure to pin and save these Toddler Tea Party Ideas for some special memories! During our special tea party, I loved capturing her adorable expressions, her mannerisms, her daintiness, her very essence of a beautiful little baby girl that’s growing up. It’s these tender moments that remind me how much I am in love with this little princess. Ready to see this table in action? Check out our video review with our sweet sweet daughter! 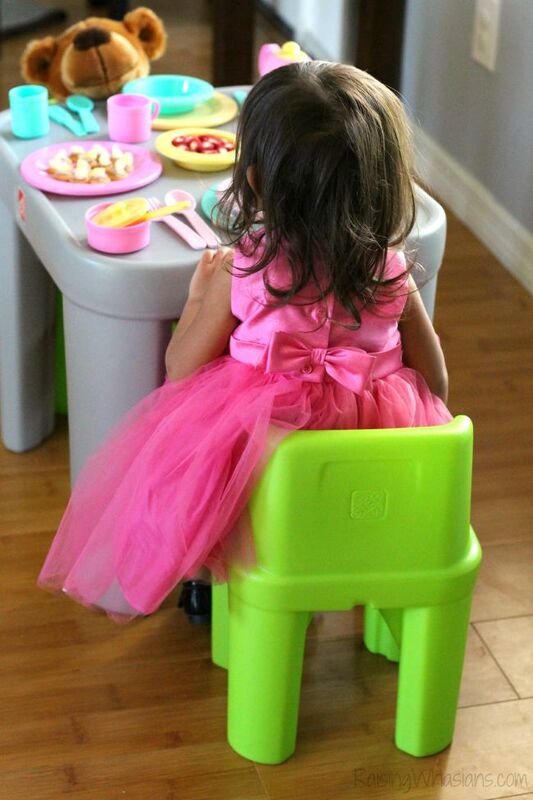 The Step2 Mighty My Size Table and Chairs Set is now available for your tea parties, craft time and endless toddler memories with the MSRP of only $49.99. Check out the full Fall 2015 Step2 Product Line for the latest toys, furniture and more! Be sure to follow The Step2 Company via Facebook, Twitter, Pinterest, Instagram, Google+ and YouTube for new products, contests, product testing opportunities and MORE! 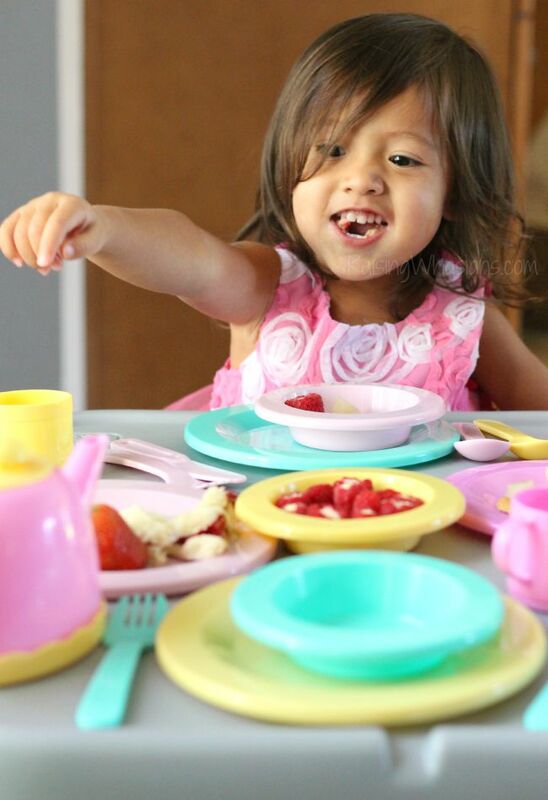 What is essential for your toddler tea parties? Be sure to follow Raising Whasians via Facebook, Twitter, Google, Instagram, Pinterest and YouTube for more family moments, reviews and kid ideas! That is so cool! I absolutely love the tea party sized snacks, too. Adorable! We love tea parties too! So fun!! This is the cutest things EVER! My daughter is now a teen but I’m tempted to dress her up and do this this weekend anyway! 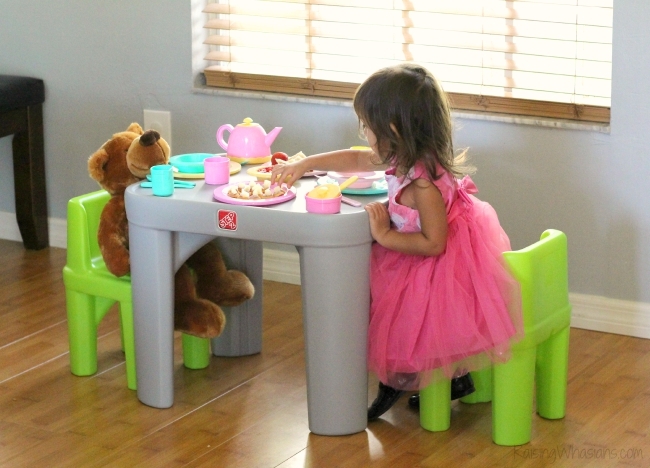 We loved doing tea parties and had several Step 2 furnishings in our play room. Kids will love this. My daughter used to love tea parties. I love all the cute snacks you made for this one. These are such fun ideas. They’re all the perfect size for tea parties. I want to try the yogurt filled raspberries first. I absolutely love that table! My daughter is now 6 and we still have tea parties, though often on the floor 🙂 However, we have made so many great memories doing this since she was a toddler that my 2 year old son joins in now too. You can’t beat those moments. This is adorable! I love all the cute foods you made! She is absolutely adorable sitting at the table with her tea party stuff. That table is so nice! This is so adorable! I need to do this with my girls! I know what I’m getting them for Christmas! These are great. The snacks are awesome and your princess is adorablle. Aww, and cute fairy like dress! What a fun celebration. 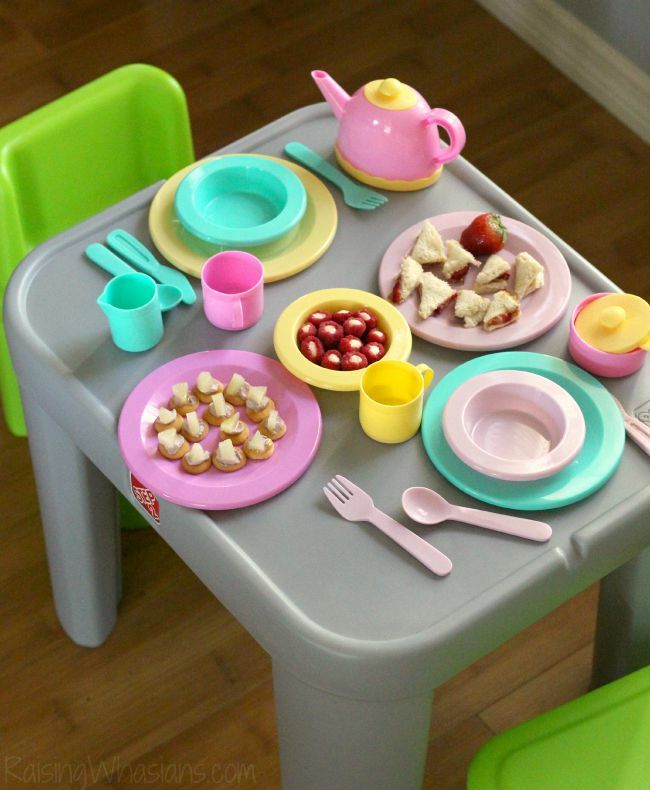 The table and chairs are perfect for a tea party. So cute, love this!! My daughter loves having tea parties, but has nothing to have tea parties on. I’m also looking for a nice tea party set. What an adorable little tea party. We love Step2 products! They are so reliable. Oh my goodness, those photos are so sweet. Can’t wait until my daughter is old enough for tea parties. Having things that are just your size makes play more fun. 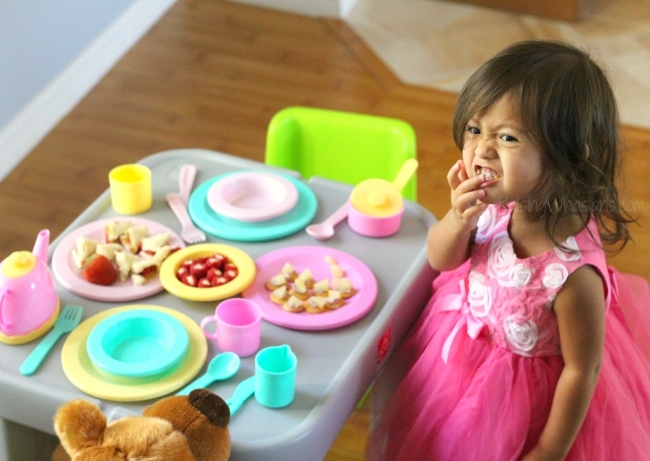 It looks like she is loving her tea party set-up. WIth that cute table, I know she’ll have many more. Everything is ADORABLE! Also, those are fancy snacks! YUM! Oh how fun. My girls used to have tea parties all the time. 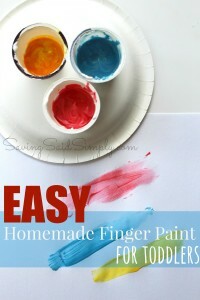 This would be such fun for my littles! I love the table and chairs. Tea parties were always my Daughters favorite. These snacks look delicious. I want to try the frozen yogurt raspberries. That’s a tea party I would love to attend. 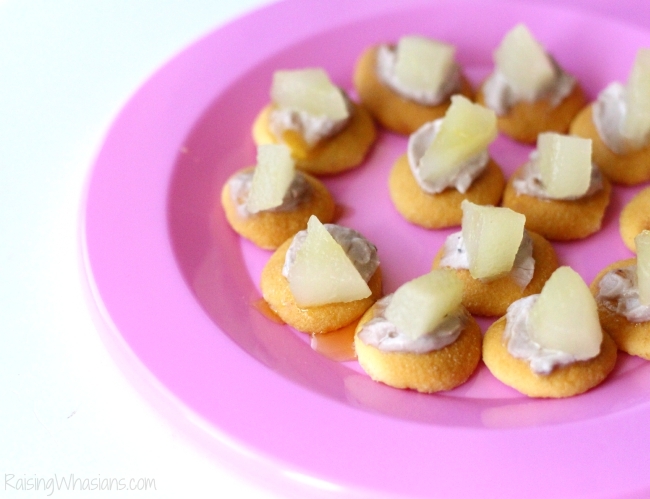 The finger foods are too adorable! This is so adorable. Kiddo had a little tea party set and table when she was younger. We played with it all the time. Then she got a tea card with a removable serving tray. That worked when she outgrew her table. This looks AWESOME! I will be having a little girl soon I can’t wait for tea party time! Sounds amazing!! My nieces love having tea parties!! What an awesome Tea Party. The table and chairs are just the right size. I also love the tea party menu. Aw how cute is she!! A cute little tea party I love the set up and decor! This is by far the cutest post ever! Tea parties are my daughter’s favorite as well. 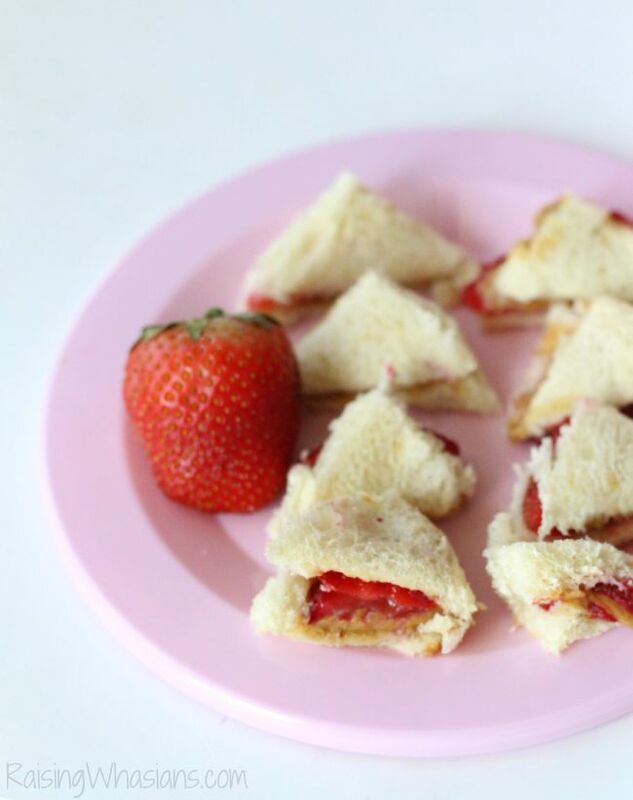 I absolutely love your tea party snack ideas!! I want to make them all right now, how delicious and healthy! What brand is the little tea pot and dishes? Kristi – I bought this set at Target for a steal – like $10?? ?